Have you ever asked yourself “how can I get more power behind my throw?” If you are looking to up your game as you take to the dodgeball courts this season then this article is for you. It’s a common misconception that you need to improve your arm strength. Well I’m telling you that arm strength has very little to do with performance in throwing. 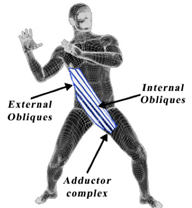 The key to launching a dodgeball with some serious heat comes from 1) rotation in your torso and 2) sequencing of movements (proximal to distal). Energy is generated from your legs and trunk and it’s transferred to your arms to propel the ball towards its target. Throwing power comes from rotational torque and your body’s ability to twist and then release that energy. This technique is similar to that of hitting a golf ball. When you play golf, your midsection does most of the work. The arms are just an extension of what’s going on from the ground up. Fig 1: Sagittal (front to back), frontal (side to side), and transverse planes of motion. Rotation occurs when we move in the transverse plane. If your body doesn’t rotate efficiently then you start to use the other planes of motion while you are throwing. That means you are generating power from the wrong place. The result – your throw gets weaker, you fatigue quicker, and you make yourself more vulnerable to injury. Why do some people have so much trouble with rotation? One of the biggest blocks to rotation is lack of mobility in the thoracic spine (upper back). Your thoracic spine should allow for a lot of rotation when you twist and turn. If it doesn’t twist well and you try to do it anyway, you compensate by overworking other areas. In the case of throwing, you take that movement from your shoulder which can lead to pain from repetitive strain. If you have chronic musculoskeletal injuries, then investigating how you rotate through the upper back is a good place to start. So, how can I get better at rotation? By working on rotation, you can become more efficient in your throwing movement, which will naturally give you a stronger and more powerful throw. This follows the principle of ‘proximal stability for distal mobility’ which simply refers to the fact that we first must have good mobility and strength along our core (midline structures along our spine) before we maximize our extremity function. 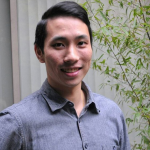 Dr. Nathan Ng is a Chiropractor practicing in Burnaby. He completed his Chiropractic education at the University of Western States in Portland, Oregon after graduating from UBC with a Bachelors of Human Kinetics. He provides care for all parts of the body and has a special interest in sports injuries. Nathan has been a member of the dodgeball community since season 8 of VDL. Email nathanngchiro@gmail.com for questions or to suggest more article topics. Find out more about Dr. Nathan at nathanngchiro.com.